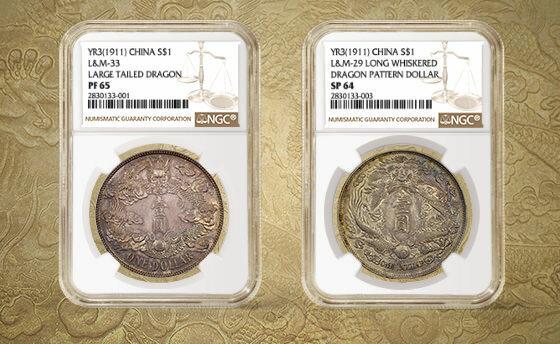 NGC is pleased to announce that it has authenticated and graded a major collection of vintage Chinese coins. Dubbed the Cherrywood Collection, the group of rare coins, including bronze and silver patterns, was housed in a small cherrywood box and has not been seen in the marketplace in over a century. The highlights include a Year 3 (1911) Long-Whiskered Dragon Silver Dollar Pattern, L&M 29, graded NGC SP 64, and a Year 3 (1911) Large-Tailed Dragon Silver Dollar Pattern, L&M 33, graded NGC PF 65. The 26 coins in the Cherrywood Collection have all been certified by NGC and are being offered without reserve by Great Collections at greatcollections.com. The coins are currently open for bidding with auctions ending on April 14 and 21, 2019. Aside from the two Dragon patterns mentioned above, there are many other bronze and silver patterns issued between 1906 and 1911 that are included in the collection.